Dumbo is the latest live-action version of a classic Disney animated feature. The studio's insistence on doing this sort of thing is frustrating. You can't top the original Dumbo, just as Cinderella, Beauty and the Beast and The Jungle Book (which blended live-action and CGI) couldn't hold a candle to the animated originals that inspired them. With these films, Disney is basically saying, “We're going to take this thing you love and give you an inferior version of it.” What's the point? Watch the classic iteration again. Tim Burton helms this remake, which adds forty-five minutes to a story that originally ran sixty-four and substantially changes the plot. What screenwriter Ehren Kruger comes up with is fairly generic. Colin Farrell plays Holt Farrier, a soldier who returns home from war with only one arm. He goes back to his job at a traveling circus owned by Max Medici (Danny DeVito). Medici has a new baby elephant that has been born with over-sized ears, and he's not happy about it. 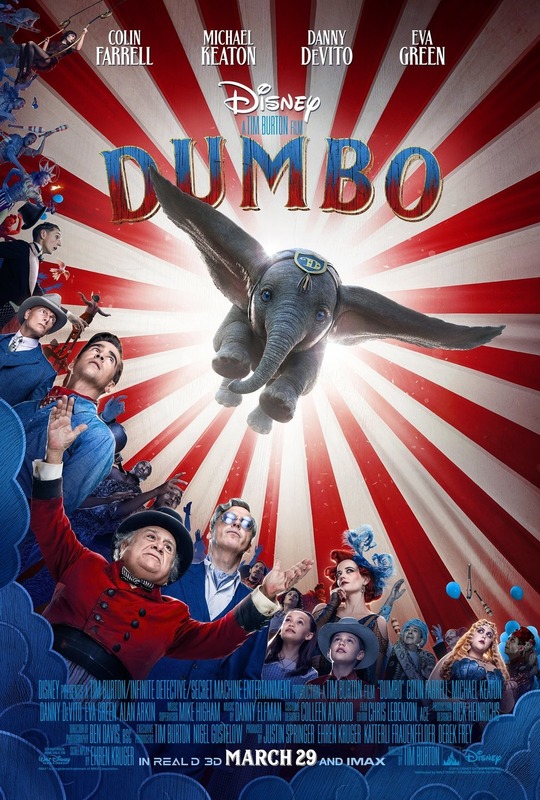 When Holt's kids, Milly (Nico Parker) and Joe (Finley Hobbins), discover that the elephant can fly, the newly-dubbed Dumbo is suddenly fit for the show. Then Medici's circus gets purchased by entrepreneur V.A. Vandevere (Michael Keaton), who, of course, really only wants the elephant. Eva Green plays his star performer, trapeze artist Collette Marchant. Vandevere convinces her to ride Dumbo in order to draw crowds to his new theme park. Holt and the kids only want to get him back to his mama, from whom he was cruelly separated. With the exception of 2014's Big Eyes, it's been more than a decade since Tim Burton made a movie that didn't feel rote. Where early films like Edward Scissorhands, Batman, and Beetlejuice had a darkly playful quality, the director's more recent work feels like a Xerox copy. He can do the “weirdo character in a larger-than-life setting” thing in his sleep. That's not to say it's done badly in Dumbo, just that Burton seems to go on auto-pilot these days. Kids may grow bored by the story, which has long, talky sections that are elephant-free. Adults will notice how familiar the plot elements are. Rich hotshot taking advantage of a small business owner? Been there, done that – x1,000. A potentially touching subplot about Milly's desire to earn Holt's acceptance of her interest in science, meanwhile, is sadly underdeveloped, which blunts the eventual payoff. There are a few pleasures in Dumbo, at least. Danny DeVito is very funny as the wisecracking circus owner. A couple of scenes – most notably one involving Dumbo performing a fire-based trick that goes almost tragically wrong – generate some mild suspense. Many of the visual effects are good, too. Dumbo looks about as realistic as a flying elephant can be made to look. (Too bad the movie does absolutely nothing with the 3D format.) Vandevere's park is similarly impressive to look at. Dumbo is not a bad movie. It is, however, relentlessly bland and uninspired. You sit and watch it passively, never feeling offended but never feeling enthralled either. The 1941 animated version is a classic for a reason. That picture exists, to be watched again and again. Why would anyone want to watch an inferior knockoff instead? Dumbo is rated PG for peril/action, some thematic elements, and brief mild language. The running time is 1 hour and 52 minutes.